It’s time to get back to you about our idea to ask that the U.S. Environmental Protection Agency make Puget Sound, including Lake Washington, Lake Union and the Lake Washington Ship Canal, off limits to discharging sewage from vessels. 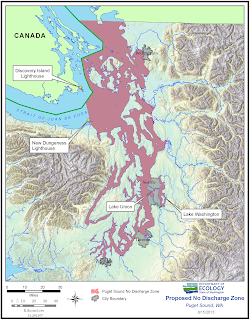 The proposed no discharge zone is part of the state Puget Sound Partnership’s Action Agenda to restore and protect water quality in Washington’s inland marine waters. We are taking on pollution problems on many fronts. This move would join other pollution prevention tactics we’re using, such as finding and fixing failing septic systems, dealing with pet waste, treating our municipal wastewater, and managing our polluted stormwater runoff. In April, Ecology completed its public comment period on the proposal to potentially establish a no discharge zone. We received more than 26,000 comments in support and about 600 who identified concerns. We’re currently summarizing the comments. And we’re continuing to work with people who have a variety of viewpoints on the topic. Our goal is to shape a thoughtful proposal. It will take time to do this right. We currently estimate it will be about a year before we make our recommendation to EPA on whether we'll move forward with a no discharge zone or what form it should take. We plan to consider all input to inform our decision. And, we expect EPA to convene its own public process prior to making a final decision on any no discharge zone. Most of all we thank everybody for taking time to let us know your thoughts. There are more than 80 no discharge zones in 26 states. This would be the first one for Washington. Boat sewage may be small in volume compared to other pollution sources, but this pollution source is not stationary – vessels and their sewage discharges can move into or near sensitive waters placing water quality and public health at risk. The draft proposal would affect a limited number of boats overall that need to retrofit. We plan to give vessels the time they need to comply. For example, we propose that tugs and commercial fishing vessels have three years to retrofit their boats with holding tanks, allowing for costs to be phased in and financed over time. Research shows that there is more than adequate pump-out capacity for recreational boaters. For commercial boaters, most discharge at sea and others can use mobile pump-outs, certain dedicated pump-outs, or pumper trucks. And, we are exploring options to include more commercial, stationary pump out facilities. Most boaters already practice good stewardship and keep their vessel sewage discharges from getting into our waters. Establishing a no discharge zone would ensure that is true for all vessels. After all, when it comes down to clean water, we’re all in the same boat.